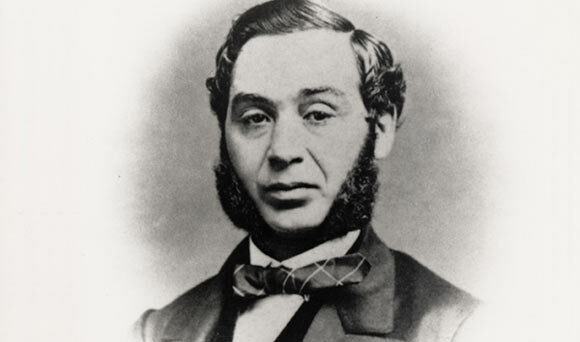 Levi Strauss (born Loeb Strauss) was an American entrepreneur and founder of the original blue jeans company Levi Strauss & Co. Born on February 26, 1829 in Buttenheim, Germany, Strauss came from a large family with three older brothers and three older sisters. His mother Rebecca was the second wife of Hirsh Strauss, who died of tuberculosis when Levi was only six years old. His mother and sisters moved to America a few years later in order to escape religious persecution that Jews were facing in Germany, including separate living arrangements and additional taxes. Upon arriving in America in 1847, the family was met by Strauss’s two older brothers in New York City, namely Jonas and Louis. These two had established a dry goods business called “J. Strauss Brother & Co.” in New York of which Levi soon became a part as well. In1853, he moved to San Francisco during the gold rush to try and make his fortune. Here he sold wholesale dry goods to the mining businesses, working on his own as well as acting as the West Coast representative of his family’s New York business. In 1863, he renamed this business “Levi Strauss & Co.” Here he sold a variety of products including sewing supplies, clothing, canvas, bedding and tools. In 1872, one of Strauss’s customers named Jacob Davis, then a tailor in Nevada, wrote to Strauss asking for his help. Davis had a business proposition where he wanted to manufacture durable pants by adding metal rivets on the pockets and front fly. He wanted to patent his idea but lacked the finances to do so. With Levi’s help, the two could patent the idea and then manufacture and sell these pants. Levi immediately liked the idea and applied for the patent, which was issued on May 20, 1873 to both men. Strauss believed these pants would be a huge success and he called them “waist high overalls”. They were initially made with canvas material and later with denim. They were dyed blue, and it has been suggested that this was done to mask stains during the manufacturing process. It has also been suggested that they were originally made by seamstresses at home and then at a factory set up by Levi in the city. As predicted by Levi, the pants were a bestselling product, and Strauss became a millionaire over the years. The pants were originally intended for laborers and manual workers, but in subsequent years were adapted as a fashion icon by all and since their invention in 1873, have become one of the most iconic and memorable articles of clothing today. The success of his pants venture led Levi to expand his business in other directions as well. He bought the Mission and Pacific Woolen Mills in 1875. He was a charter member and treasurer of the San Francisco Board of Trade, and a director of the “Nevada Bank”, the “Liverpool, London and Globe Insurance Company” and the “San Francisco Gas and Electric Company”. He was well known for his philanthropy, and particularly cared about orphans. He contributed to the “Pacific Hebrew Orphan Asylum and Home”, the “Eureka Benevolent Society” and the “Hebrew Board of Relief”. He also set up 28 scholarships at the University of California, Berkeley, which are still awarded to date. He was a contributing member of the city and built the first synagogue there called “Temple Emanu-El”. He never married and left his vast fortune to his relatives, who inherited the business and continue to run it after his death in 1902.